In Grand Blanc Michigan the Former Fisher Body Tank Plant sits abandoned after operating as a major American tank plant from 1942-1945. Built From the ground up to accommodate the growing need for tank production in the United states during World War II, it became one of the most important but understated production facilities in the United States. The production of multiple tank types using employees of broad backgrounds within the facility demonstrates how American industry overwhelmingly supported the Allied efforts during WWII. The American war effort during WWII saw many factories converted to wartime production. What would come to be known as the Fisher Tank Arsenal was on major component of this Wartime production. This major component was the fact that Fisher as a whole was the third largest producer of tank components during the war (Hyde, n.d.). However one plant stood out as a major producer of tanks and that was the Fisher Body Grand Blanc Division.The construction of Fisher Body in Grand Blanc produced a massive facility at the time ,measuring 452,000 square feet (Jackson, n.d.). This 452,000 square feet was dedicated solely to the production of Tanks which began in 1942 (Allen, 2013). With the onset of WWII much of the country had been preparing for a world war in which the dedication of American industry would be needed to win. General Motors, one of the biggest automobile companies at the time, became heavily involved and contributed $12 billion of materials related to the war effort (Reinhart). 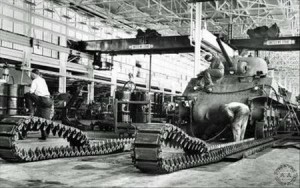 Fisher Body a division of General Motors helped contribute to the effort through the construction of a new plant dedicated to building tanks. 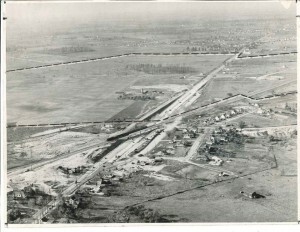 Figure 1, shows an aerial view of the grounds in 1941, on which the plant would be built (Fisher Body). Once built the 452,000 square foot facility would contribute a large portion of the 38,000 total tanks produced by General Motors. (Reinhart). Fisher Body in Grand Blanc was responsible for a large portion of these tanks. Many different components of wartime necessity were produced including: M4 Series Tanks, T-26 and M-26 series Pershing tanks, M-10 Tank Destroyers, and M-36 Tank Destroyers (Jackson, n.d.). As an example of the massive tank production that occurred, a contract was given to Fisher Body for 1800 M10 Tank Destroyers which was fulfilled with the total production of 5,668 M10 Tanks in December 1943 (Hyde, n.d.). The total number of tanks produced is staggering as 18,413 Tanks and Tank Destroyers were built between 1942 and 1945 (Jackson, n.d.). The Final tank produced in Grand Blanc was a M36 Tank Destroyer picture in Front of the Fisher Body Plant (Final Tank). These numerous tanks undoubtedly saw action in not only WWII, but also in the Vietnam War (Allen, 2013). According to General Motor’s 1943 report the employment of Americans to support the war effort is staggering. The total employment of GM’s wartime efforts totaled 448,848 people during 1943 (General Motors Corporation). Of these 448,848 employed, approximately 68,000 people were employed by fisher body during the war (Coachbuilt.com, n.d.). Due to the war efforts many able bodied men were involved overseas leaving a void to fill in the industry. General Motors filled this void by tapping into the work force of Women in the United States, with the proportion of women employees reaching 30.7% at the end of 1943 (General Motors Corporation). What is more impressive, is the little time that was allotted to train for an entirely new job. Training consisted of multiple classes all to prepare for a job that they had never completed before (Coachbuilt.com, n.d.). The sheer number of employed people and amount of tanks produced shows how significant the General Motor’s war effort and Fisher Body Grand Blanc was to WWII. 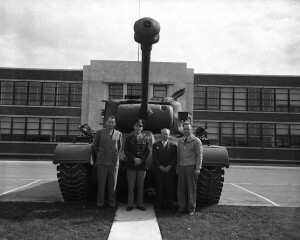 Fisher Body’s main product, the M4 Sherman Tank, were well used in multiple Theaters by America and its Allies (Nationalww2museum.org). At a weight of 33 Tons and a top speed of 26 MPH it was easily outclassed by enemy Tiger and Panther Tanks (Nationalww2museum.org). The superiority of the enemy tanks over the Shermans was summed up by Lt. Colonel William B. Lovelady, and retold by Lt. Colonel Haynes Dugan (Hopkins). Of one instance Dugan recalled “One of his Sherman’s turned the corner of a house and got off three shots at the front of a Panther, all bounced off. The Sherman then backed behind the corner and was disabled by a shot penetrating two sides of the house plus the tank (Correspondence,2).” This firsthand account of the Sherman Tanks shortcomings show how difficult it must have been to serve in an less advanced machine against advanced technology. However the Sherman did have on advantage to enemy tanks in its ability to be quickly mass produced as they were in Fisher Body and many other plants. In mid-1944 it was estimated that the total Allied force of tanks in France numbered 4500 units, which was a margin of about three times the amount of enemy tanks present (Hsu). Even with heavy losses and damaged tanks a force of three times an opponent would be a reasonably easy defeat to complete. Which with German tank plants and resources being destroyed only worsened their condition and improved the allied ability to win. The use of the M4 Sherman during WWII was a key element in the Allied War Effort. So much so that General George Patton credited the tanks with being a important part of the war effort when their quality was called into question. The claims made by Patton of Greater Mobility against Nazi Tanks in order to attack them strategically rather than with brute force (Press). Patton also claimed that since “ the third army became operations, our total tank casualties have amounted to 1,136 tanks. During the same period we have accounted for 2,287 German Tanks (Press). The backing of the tanks produced in Grand Blanc, by General Patton shows that the tanks produced were important in the Allied War Effort. This was the goal of the United States at the time and demonstrates how the arsenal of Democracy was important in the Allied WWII war effort. General Motors Corporation,. 35Th ANNUAL REPORT OF GENERAL MOTORS CORPORATION. 1943. Print. Press, Associated. ‘American Tanks Vigorously Defended By Expert, Gen. Patton’. The Milwaukee Journal 1945: 2. Final Tank Produced at Fisher Body Grand Blanc. 1945. Flint Journal Archives, Flint. Fisher Body Tank Plant Prior to Construction. 1941. Flint Journal Archives, Flint. Correspondence from Haynes Dugan to Walter Stitt. Book Review, Record Series 26/20/76, Box 10, Folder 1998, January-September, p. 2. Allen, J. (2013). From tanks to Fisher Body and beyond: A look at Grand Blanc Weld Tool’s history.MLive.com. Retrieved 7 October 2015. Coachbuilt.com,. FisherBody Company, Fisher Body, Fisher Body Division, Fisher Brothers, GM,Fred Fisher, Albert Fisher, Charles Fisher, Fleetwood, General Motors,Standard Wagon Works, Coachbult.com. Retrieved 7 October 2015. Hyde, C. Arsenal of democracy (p. 128). Jackson, D. Fisher Body Grand Blanc Tank Arsenal in World War Two.Usautoindustryworldwartwo.com. Retrieved 7 October 2015. Preservedtanks.com,. Preserved Tanks .Com | Location Profile. Retrieved 7 October 2015. Reinhart, Ralph. ‘1942, Production Goes To War – Generations Of GM’. History.gmheritagecenter.com. N.p., 2015. Web. 18 Nov. 2015. Hopkins, Nicholas. ‘A Poor Defense: Sherman Tanks In WW2 – University Of Illinois Archives’.University of Illinois Archives. N.p., 2013. Web. 8 Dec. 2015. Nationalww2museum.org,. ‘The M4 “Sherman” Tank’. Web. 8 Dec. 2015. Hsu, Jeremy. ‘“Good Enough” Tanks Won WWII – Lovesick Cyborg’. Lovesick Cyborg. N.p., 2014. Web. 8 Dec. 2015.